The two main factors driving food packaging are security and changing lifestyles. Statistics suggest that 30-40% food gets damaged across the value chain. With lifestyle modifications in play due to increasing urbanization, consumer requirements have changed compelling them to choose those products which can be readily used. These are ready to eat & ready to cook foods available in microwaveable packaging, carry away packs, re-sealable packs, easy-to-open packs and longer shelf life packages. The growing food processing industry greatly relies on packaging in terms of high barrier, aesthetics, logistics and handling. To meet the above mentioned packaging requirements, smart packaging needs to be developed. Keeping this in mind, Ester has developed an innovative product portfolio which showcases our commitment to dynamic and challenging packaging needs. We offer sustainable packaging solutions for variety of foods such as fresh foods, processed foods, foods-on-the-go, shelf stable, ready to eat and liquids. By offering vivid print quality, superb product freshness, powerful taste, aroma protection, and extended shelf life, our packaging materials enhance the ultimate appeal of food products. 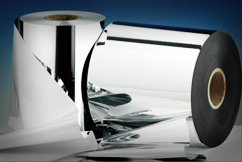 Our broad range of barrier films, coated films and lidding films ensure that retail customers get best quality food as intended by the manufacturer. Whether your goal is extended shelf life, product protection, liquid containment, flavor and aroma protection or unique sealing properties - the Ester product portfolio of value added and specialty polyester films, specialty polymer resin & master batches are designed to meet the challenging needs of the diverse food products available in the market.